Vision is arguably the most important of the five senses. It plays a crucial role throughout childhood and beyond. Yet many parents don’t understand how vision helps their children develop appropriately. Visit us at Dr Gallo & Associates to proactively care for your child’s eyes, spot potential trouble, and maximize the opportunity for crisp, convenient and healthy vision. When is it time for an eye exam? If you suspect something is seriously wrong with your baby’s eyes in their first few months of life (a bulging eye, a red eye, excess tearing, or a constant misalignment of the eyes, for example) take your child to a pediatric ophthalmologist or other doctor immediately. 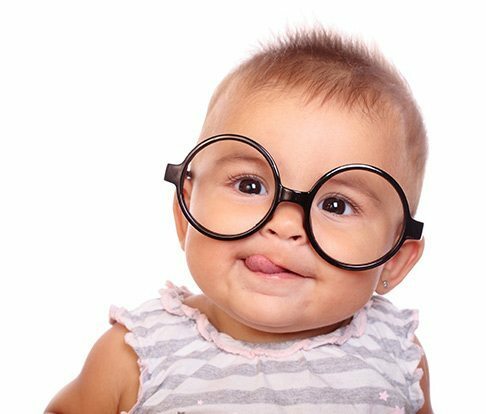 For routine eye care, the Canadian Association of Optometrists (CAO) recommends you schedule your baby’s first eye exam when they are six months old. Though your baby cannot yet read letters on a wall chart, our optometrists can perform non-verbal testing to determine visual acuity, detect excessive or unequal amounts of nearsightedness, farsightedness and astigmatism and evaluate eye teaming and alignment. At this exam, our optometrists will also check the health of your baby’s eyes, looking for anything that might interfere with normal and continuing vision development. There’s so much for your little one to see and experience during their first years, and having clear vision will help them during their development. One of the greatest moments after the birth of your baby is the first time your newborn daughter or son opens their eyes and makes eye contact with you. But do not be concerned if that does not happen right away. Be sure to follow the instructions your obstetrician gives you regarding proper nutrition and the proper amount of rest during your pregnancy. And of course, avoid smoking and consuming alcohol or drugs during pregnancy, as these toxins can cause multiple problems for your baby, including serious vision problems. Colour vision develops in the first few weeks of life, so your baby is starting to see the world in full colour. But visual acuity and eye teaming takes a bit longer, so if your infant’s eyes occasionally look unfocused or misaligned, don’t worry. Visual acuity develops rapidly, improving from about 20/400 at birth to about 20/25 at six months of age. Your child’s colour vision should be nearly fully developed at age six months as well, enabling them to see all the colours of the rainbow with ease. Dr Gallo & Associates welcome providing eye care for even the youngest children. For more information about eye exams for children or to schedule your child’s first eye exam, please call our office.